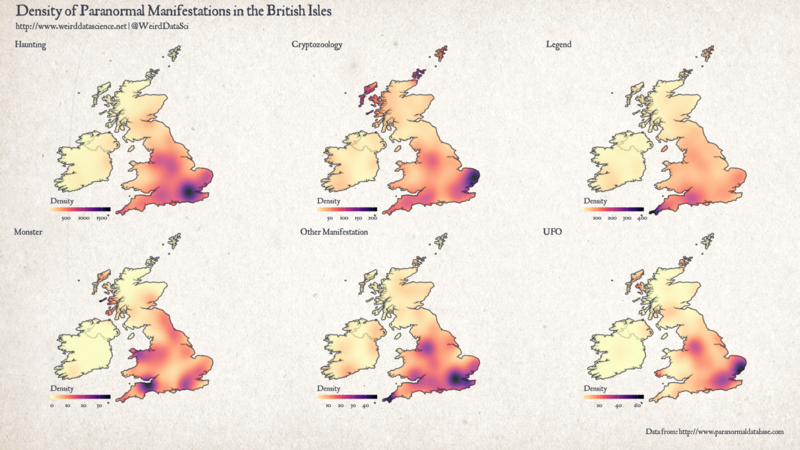 In our last entry we analysed the relative frequency of paranormal manifestations in the British Isles according to the Paranormal Database. 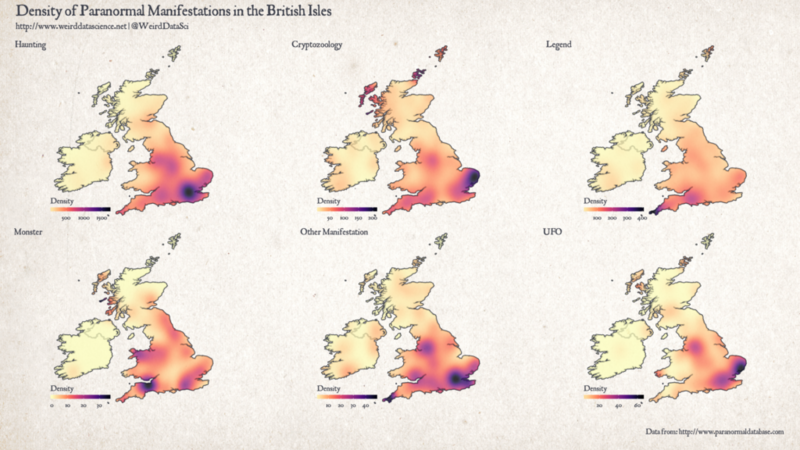 The results of that analysis showed that hauntings of various forms are by far the most commonly-reported paranormal encounter in the British Isles, followed by cryptozoological sightings. This is, however, relatively unsatisfactory. It is much more interesting to know where such sightings and events occur. Are there particular haunts of restless spirits? Do mysterious beasts roam in particular regions more than others? To answer these questions, we need to delve into the specific locations of different reports. The geolocation is not perfect, but with sufficient manipulation of the service it was possible to produce geolocated coordinates for most of the entries in the database. In order to represent these meaningfully, we have also subdivided the entries into a different types. The original Paranormal Database data is subdivided into twenty categories, which we have reduced to six for easier presentation. This includes collapsing the various kinds of haunting, from poltergeists to ‘post-mortem manifestions’, simply to hauntings. Similarly, we combine alien big cats and shuck into the broader family of cryptozoology. 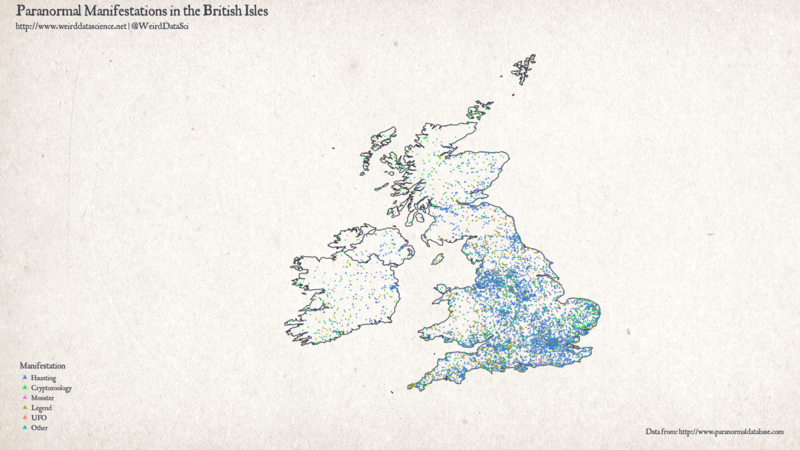 With this in place, we can see the overall distribution of paranormal events in the British Isles. As might be expected, London is a dark and sinister nexus of paranormal activity. Hauntings, as might be expected from their overall frequency, dominate the majority of the British Isles. Moving north, particularly as we reach the Scottish Highlands, cryptozoological sightings begin to challenge hauntings as the most common supernatural event. We can also see significant cryptozoology in the Hebrides, Orkney, and Shetland — the archipelagos that surround the Scottish mainland. Both Wales, Ireland, and Cornwall are significantly less densely haunted in the Paranormal Database, with the majority of sightings falling in England. This overall view, however, combines a number of very different phenomena. Where, for example, are we most likely to receive a visitation from a restless spectre as opposed to being pursued by a savage and unnatural beast? By breaking down the sightings into different types, and plotting a heatmap of event density over each, we can identify the regions in which different manifestations cluster. This view highlights several points of interest. Firstly, London’s preeminent position is not for all forms of paranormal activity. Hauntings are extremely dense in London, however the rest of England is also well-populated. As might be expected from the first diagram, the less population-dense regions further north have produced fewer sad echoes of mortality. Despite its general reputation Edinburgh, while noticeably haunted, cannot compare with many regions of England. Cryptozoologically, however, London is far from dominant. Whilst unknown beings may lurk in the foetid sewers of the capital, they clearly prefer the wide open spaces — both the Norfolk and Suffolk Broads are rife with cryptids, as are the Hebrides, Orkney, and Shetland that were noticeable earlier. Finally, visitors to Cornwall will pass through areas of increasing monstrous activity. UFO’s also appear to be attracted to East Anglia most strongly, and are otherwise most common in the large population centres of England. Less obviously, there is a noticeable density of UFO activity on the Pembrokeshire Coast, in the south-west of Wales. Monsters, which in this classification includes werewolves, vampires, and dragons, produce a surprising cluster in North Wales, around Snowdonia. The most significant monstrous sightings, however, appear to be in Exmoor; again on the south-western tip of the British Isles. The final categories of manifestation include legends, fairies, and a catch-all category of ‘other manifestations’ that include mysterious orbs, talking trees, bleeding stones, and the supernatural impressions left by the work of John Dee. As might be expected, this last category is more uniformly distributed across the country, matching high-density population areas. There is, however, another notable cluster in Cornwall for this category. 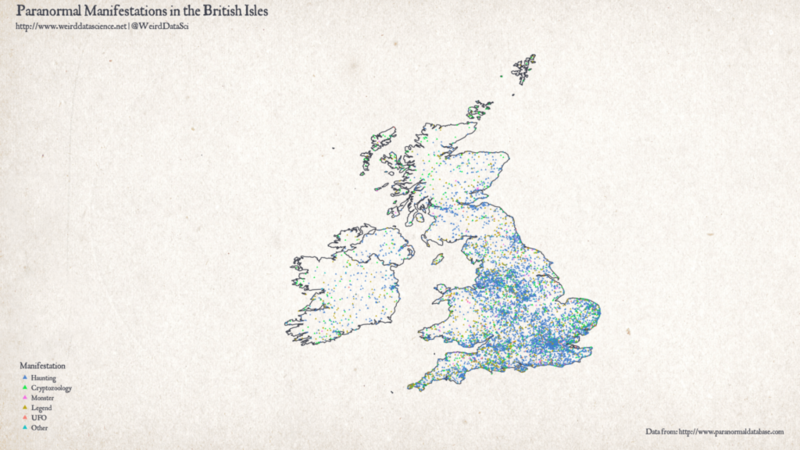 In conclusion, then, the British Isles are teeming with paranormal activity. Entities from beyond the grave lie close at all times, with twisted monstrosities roaming the wild spaces. UFOs descend from the night sky to terrorise the coastal regions. From this analysis, ghost hunters should concentrate on London for the best chance of a sighting, although almost any of the large centres of population provide a reasonable chance of spectral apparitions. Cryptid researchers should concentrate in East Anglia or head north to the islands beyond Scotland. Those seeking contact with extraterrestrials should focus particularly on the east coast of Suffolk, or travel to the south-west of Wales. Paranormal investigators whose interests lie in legends or monsters, or less specific strange entities, would be well-advised to visit Cornwall. Code for the plotting elements of this analyis are given below, following on from the scraping and parsing code in our previous post. The geolocation step required a more significant effort, and will be the focus of a future code-based post. You can keep up to date with our latest paranormal data mining on Twitter at @WeirdDataSci. #  "Alien Big Cat"                "Crisis Manifestation"
#  "Manifestation of the Living"  "Other"
#  "Shuck"                        "Spontaneous Human Combustion"
#  "UFO"                          "Unknown Ghost Type"
type %in% c("UFO") ~ "UFO"
# Read world shapefile data and tranform to an appropriate projection. # explicit longitude and latitude projected appropriately for plotting. # Function to plot density of a specific manifestation type. # plot_resolution is for the density raster, and is mainly used for quick prototyping of the output. Why have you excluded the Isle of Man? Actually, it looks like a mistake on my part in the mapping code. I had assumed, without really thinking about it, that it would be included when I restricted my map features to the UK and Ireland. I’ll go back over the code and see if I can get it updated. Thanks – the Isle of Man has an important paranormal history, especially fairies, witchcraft (e.g., Gerald Gardner) and Gef the talking mongoose. The maps are now updated with the Isle of Man. There’s a definite skew towards cryptozoology and legends, although there seem to be some hauntings down to the south-west. Thank you for pointing out the oversight! However, your first png is still not showing IOM. It has been updated, but may be cached in your browser — try a full refresh of the page. Great – yes it’s there now. Thanks. Excellent undertaking – this kind of visualisation is what I wanted to have as a tool for years and here you are. Is there also a way to connect the dots, by hovering over them with cursor, with any underlaying data, such as accounts files, book excerpts, newspaper clippings, footage, audio files, reports and so forth? Also, a time-beam placed below for the chronology of the data (progression over time)? And a selection tool for the various sub-phenomena? If you look at the Global UFO Inquirer on a previous blog post: http://www.weirddatascience.net/blog/index.php/2018/02/22/unveiling-the-global-ufo-inquirer/ — direct link at http://laboratory.weirddatascience.net:3838/weirddatascience.net/global-ufo-inquirer — then that’s probably not dissimilar to what you’ve described there. Creating that sort of thing isn’t particularly hard once you’ve got the data. Selection by type would be very easy once you had the basic map. Timing is probably even more difficult. Again, the Paranormal Database lists times very informally: “unknown”, “some time in the 1800s”, “June 1937”, etc. That makes it difficult to create a time slider, as many events can’t be dated, and for others you would have to do a lot of work to turn it into computer-readable dates. For the extra information, it’s very easy to link it to a popup like in the Global UFO Inquirer, if you have the data. You could start with the full entry on the Paranormal Database. I didn’t want to do it directly here, as that would effectively be duplicating the Paranormal Database, which felt rude. For linking to other sources, that would be a manual process. With over ten-thousand entries, that would be quite a task! So, a lot of what you’re thinking is within the bounds of possibility. A location map with clickable events marked might happen in the future. For dates, and for other information sources, it would sadly require far more time than I have available! I’m glad you like the maps, though. I’ll try to keep new and interesting things coming.